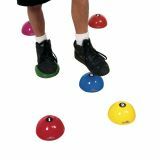 Sportime Step-N-Stones are unique air-filled domes that audibly release air and become flat when stepped or pushed upon, but instantly recovers their shape when foot or hand is lifted. Latex free Step-N-Stones can be used as a lead-up balance activity, a sequencing challenge, a math exercise, or a way to safely cross a mystical river. Each Stone is roto-molded in one piece, and is so durable that it should never need replacement. Latex free. Set includes 6 Step-N-Stones numbered 1-6, with one in each color: Red, Yellow, Blue, Green, Purple and Orange.